Honda Ridgeline is the mid-size pickup truck with the formula for the best-class ride quality and interior comfort. The model uses SUV-based design and running gear and comes with SUV-like convenience and comfort features. The sophisticated all-wheel-drive design provides all-surfaces traction but the model can’t match the class towing capabilities. Still, 5,000 pounds of towing will satisfy most demands while buyers will also love unique truck bed solution. The Ridgeline arrived all-new for the 2017 model year and few changes were made in the equipment range for the 2018 version. For the third model since the redesign, Honda isn’t also expected to do much and we expect the 2019 Honda Ridgeline with some revisions in the equipment organization and with few updated features. The new versions will likely add more standard equipment and make more active safety systems available in the lower trims. Bigger upgrades will arrive with next model versions when we should expect turbocharged engine option and hybrid powertrain as well. The 2019 Honda Ridgeline will return with the familiar exterior design and changes could include new color options, special exterior theme and new wheel options. Honda will again offer this model with the crew cab body style only which maximizes the interior comfort. 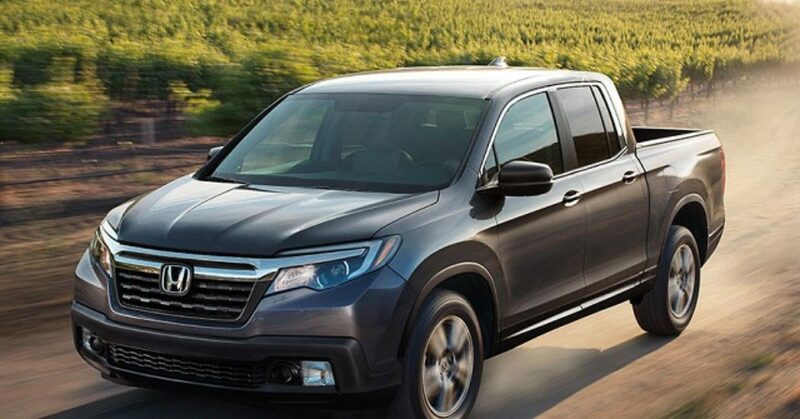 The Ridgeline shares the platform with the popular Pilot SUV and the styling is also inspired by this high-riding model. Honda, of course, made some structural improvements to support better towing and working capability needed for the pickup truck. The truck also has Honda’s familiar face and sculpted profile. The dual-action tailgate also improves model’s versatility. Interior of the Ridgeline brings the assembly and material quality plus the comfort of SUVs to the mid-size truck class. The truck has attractive, Pilot SUV-inspired cabin with the equipment level that also matches SUV standards. The new version won’t change the interior design but should bring some desirable features to lower trims. The advanced safety gear like the adaptive cruise control, lane departure warning and intervention, forward collision warning, automatic emergency braking, blind spot monitoring, etc. should become available in lower versions. Honda will also make some upgrades to the infotainment system options. The 2019 Honda Ridgeline will rely on the 3.5-liter V-6 engine and smooth 6-speed automatic transmission. This combo will provide 280 hp and torque of 262 pound-feet. The front-wheel drive will be standard and multi-surface traction will be provided by the sophisticated all-wheel-drive system. The SUV-like underpinning will deliver best in class handling while the truck will still be able to provide class-relevant 1, 570 pounds of the payload capacity. However, the model won’t be able to pull like the class leaders but will still meet most of the needs with 5, 000 pounds of towing capacity. In the near future, Honda will offer more powertrain options and brand recently announced the hybridized powertrain for the entire light-truck lineup. Additionally, we should expect turbocharged engine option in this truck. Honda will bring the 2019 Honda Ridgeline in the last quarter of 2018. The price range will again start at around $30k and climb above $40k in high-end versions.